This monthly Bengali Spice Combo has been created keeping in mind the daily need of authentic Bengali spices in our Bengali kitchen. This Bengali Spice Combo consist of 6 different spices namely- Panch Phoron (100 grams), Radhuni (50 grams), Sunrise Mustard Powder (50 grams), Cookme Posto Bata (50 grams), JK Posto (100 grams) and Sahi Garam Masala (50 grams). So why wait? Make all such authentic Bengali dishes with this spice combo at home. This Bengali Spice Combo (6 Spices) will be delivered to your address every month for next three months from the date of booking. 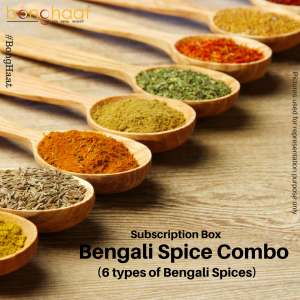 The Bengali Spice Combo (6 Spices) will be delivered in the first week of every month. 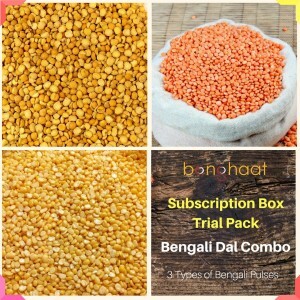 This Trial Pack Bengali Dal (Pulses) Combo has been created keeping in mind the daily need of authentic Bengali Dal (Pulses) in our Bengali kitchen. This Bengali Dal (Pulses) Combo consist of 3 different Dal (Pulses) namely- Sona Moong Dal (1 KG), Sona Masoor Dal (1KG) and Matar Dal (500 Grams) So why wait? Make all such authentic Bengali dishes with this Dal (Pulses) combo at home. This Mirchi Chef’s Bengali Dal (Pulses) Combo has been created keeping in mind the daily need of authentic Bengali Dal (Pulses) in our Bengali kitchen. This Bengali Dal (Pulses) Combo consist of 3 different Dal (Pulses) namely- Sona Moong Dal (1 KG), Sona Masoor Dal (1KG) and Matar Dal (500 Grams) So why wait? Make all such authentic Bengali dishes with this Dal (Pulses) combo at home. This Bengali Dal (Pulses) (3 Types) will be delivered to your address every month for next three months from the date of booking. 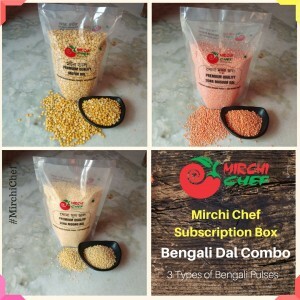 The Bengali Dal (Pulses) Combo (3 Types) will be delivered in the first week of every month. This Mirchi Chef’s Trial Pack Bengali Dal (Pulses) Combo has been created keeping in mind the daily need of authentic Bengali Dal (Pulses) in our Bengali kitchen. This Bengali Dal (Pulses) Combo consist of 3 different Dal (Pulses) namely- Sona Moong Dal (1 KG), Sona Masoor Dal (1KG) and Matar Dal (500 Grams) So why wait? Make all such authentic Bengali dishes with this Dal (Pulses) combo at home. Cookme, a household brand across India, enjoys the 170 year culinary heritage of Shri Krishna Chandra Dutta’s business acumen. We at Bong Haat have handpicked this assortment of Bengali Spice (Masala Powder) Combo specially for you. This Bengali Spice (Masala Powder) Combo pack has been designed keeping in mind the popularity and usage of them in Bengali kitchen by the Bengali housewives. All the items of this combo pack are sourced from the Cookme Masala in Kolkata. This Cookme Regular Spice Combo pack consists of 6 types of Bengali Spice (Masala Powder) namely Black Pepper Powder 50 grams, Coriander powder 50 grams , Cumin powder 50 grams, Kashmiri Mirch powder 50 grams, Red Chilli powder 50 Grams and Turmeric powder 100 grams. Buy this Bengali Spice (Masala Powder) Combo pack at the convenience of just a click and live a life in a Bengali way. With this regular spice combo from Cookme will make your food a lip smacking one as Cookme believes in making everyday a delicious journey. This Bengali Spice Combo (6 Spices) will be delivered to your address in the first week of every month for next three months from the date of booking. Cookme, a household brand across India, enjoys the 170 year culinary heritage of Shri Krishna Chandra Dutta’s business acumen. We at Bong Haat have handpicked this assortment of Bengali Spice (Masala Powder) Combo specially for you. This Bengali Spice (Masala Powder) Combo pack has been designed keeping in mind the popularity and usage of them in Bengali kitchen by the Bengali housewives. All the items of this combo pack are sourced from the Cookme Masala in Kolkata. This Cookme Regular Spice Combo pack consists of 6 types of Bengali Spice (Masala Powder) namely Black Pepper Powder 50 grams, Coriander powder 50 grams , Cumin powder 50 grams, Kashmiri Mirch powder 50 grams, Red Chilli powder 50 Grams and Turmeric powder 100 grams. Buy this Bengali Spice (Masala Powder) Combo pack at the convenience of just a click and live a life in a Bengali way. With this regular spice combo from Cookme will make your food a lip smacking one as Cookme believes in making everyday a delicious journey. This Bengali Spice Combo (6 Spices) will be delivered to your address in the first week of every month for next six months from the date of booking.